This, my friends, is my official ‘Critter Catcher and Releaser Pitcher’. As you can see in the picture, thanks to Sissy, it is currently holding a baby field mouse. On average, I have to use this pitcher 1-2x a month to catch an escaped mouse, or other small critter that one of the six cats decides to bring inside, for what I’m really beginning to think is for bragging rights. Why else would you bring your catch in the house to have it be taken away by someone else or from your unhappy owner whose policy on the subject is ‘No’. This particular tall and square pitcher is ideal for covering narrow openings along the wall (like behind the tv or telephone table) and then using a yard stick to gently encourage the frightened little critter to go forward into it. Because it’s clear, I’m able to see when the critter is inside, and can then quickly tilt the pitcher up, pop the lid on and take them outside to hopefully live another day. No, it’s not a glamorous tool or job, but it IS a necessity in my household. At least until the cats go vegetarian. Or read the policy manual. 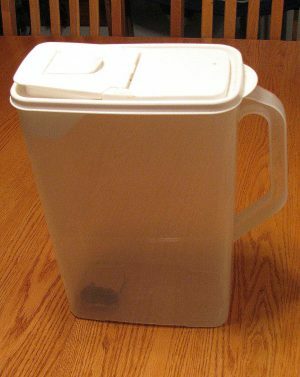 While I’ve had my pitcher for several years, here’s one that’s similar if you need something to help you contain the outside critters that end up inside. If you happen to have a cat door as well, it’s likely that you too, have at least an occasional ‘outside things being brought inside’ problem. Providing your indoor/outdoor cats with their own door definitely has its downsides, like the worry that someone is going to bring something from the outdoors inside to chase (see Exhibit A) and ultimately eat on your rugs or carpet, like this post demonstrates…Excitement on Wednesday night (as opposed to being kind enough to at least do it on the vinyl flooring). Having taken in four adult cats that were used to coming and going as they pleased and expected to be able to continue that, putting in their own door was almost a necessity (for my sanity). It has saved me from continually being awoken in the middle of the night/wee morning hours by someone meowing loudly, wanting out or to just check to see if they possibly wanted out. It also has stopped them from resorting to attempting to tear apart the trim and such around the doors, to get out when their requests to be let out were ignored or just took too long. Luckily, my handy dandy ‘Pitcher’ is always nearby, ready to be grabbed at a moments notice to help make one less meal a mess. Thank you, Mr. Pitcher Inventor.